How to pass values to be displayed on the report? I am using Visual Basic in Visual Studio 2012 with Crystal Reports for Visual Studio. 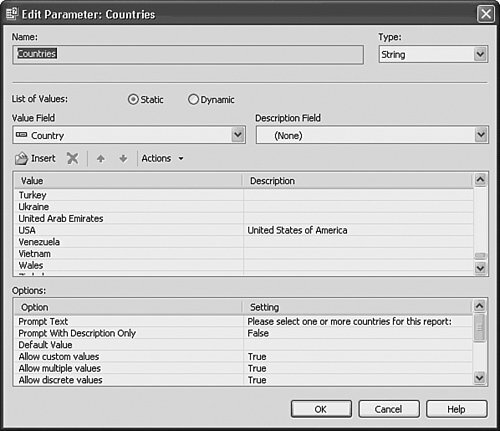 I have a parameter in a Crystal Report that can accept multiple values (for instance: Regions).... I don't know whether you can programattically add new parameter fields to a report without running into undefined/bad behavior. My question is, why would you want to add parameter fields dynamically? How can the report itself benefit from a field that otherwise is not referenced by the report? I am developing a windows application and am using crystal reports in it. I am trying to add the parameter field in it, however, when I click on the OK button, it is just not working.... 26/05/2010 · Thanks NateZilla77 i saw this link, but it does not help me. i want to pass parameter to Unbound field object (IFiledObject), not parameter field. 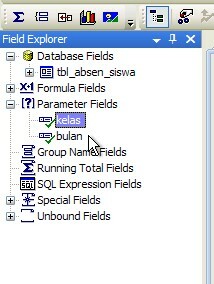 for example u drag & drop an unBound field to your report. now u want to pass value to it via code. this is my situation. I am using Visual Studio 2008(vb.net), SQL Server 2008 and Crystal Report 9. I have created a stored procedure in SQL Server I have added this procedure in Crystal Report Data Expert Now, I just want to pass a parameter to Crystal Report so that it will show me data in Crystal Report. how to add event on facebook -Step 3: Add a Crystal Report and link to the table of dataset Now you have a schema of a dataset that connects to the TblProduct of the SaleAndStock database located in SQL Server. The next step is to add a Crystal Report item in to your project. I am developing a windows application and am using crystal reports in it. I am trying to add the parameter field in it, however, when I click on the OK button, it is just not working. I always prefer to add business logic in SQL Server Stored Proc instead of creating formulas, custom fields and other things in reports which just add complexity to the report. So I added business logic for a custom field to show Total of value of Product entry and to return all Customer details if input parameter CustomerID else return only Orders related to Customer is empty. I want to have one field in my crystal report in vb.net, I want to display in this textfield is the value of textbox in vb.net form. I made parameters named "prog_user" and set the value of this to the textbox.text but it doesn't display anything.